Korean actor, So Ji Sub, who has won the hearts of Asian fans with his role as Joo Joong Won in drama The Master’s Sun, will be in Singapore for his first fanmeet at The Star Performing Arts Centre on August 22. As a result of the overwhelming success of The Master’s Sun, fans from abroad have expressed interest in meeting the actor. So Ji Sub’s company decided to put an Asia tour together for him to meet his overseas fans and to express his gratitude for the astounding support he has received personally. The tour kick-started in Taiwan and was met with a great success. 3000 tickets were snapped up within three hours after going on sale on 1 June, causing the ticketing website to crash temporarily. An additional night was even added due to popular demand. 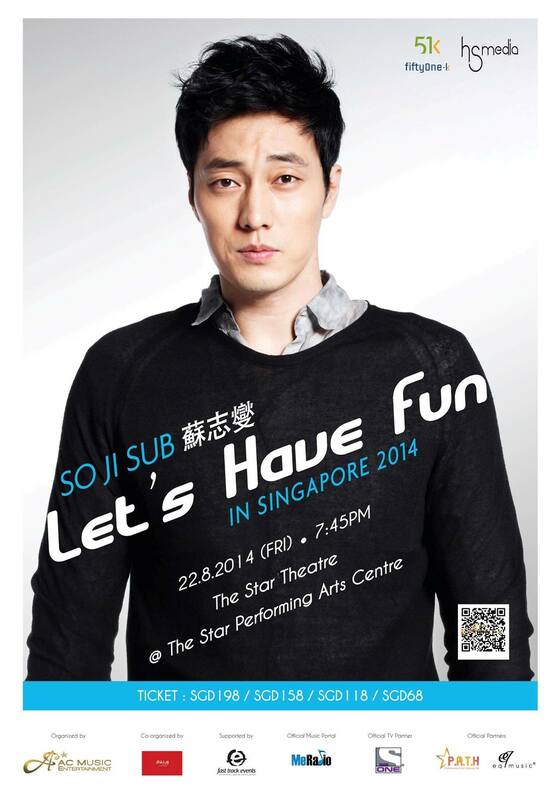 Presented by AC Music Entertainment Pte Ltd, the 100-minute fan-meet titled SOJISUB – Let’s have fun in Singapore 2014 will be the 36-year-old’s first visit to Singapore. He is said to be thrilled to meet his local fans and has promised to make this fan meet as engaging as possible. So Ji Sub, who has recently released a rap single ’18 Years’, will also be preparing various performances to make the event memorable and meaningful for everyone. Besides his Singapore stop, So Ji Sub will be bringing his Asia tour to Japan and Thailand. He will be making one stop in Bangkok on 29 July and two stops in Kobe and Yokohama on 18 and 21 July respectively. At the Open Press Conference, fans will be able to see So Ji Sub answering the media’s questions on stage within close proximity. 500 posters will also be given away at first-come-first-serve basis at the venue starting from 5pm. For more information, do visit www.citysquaremall.com.sg or www.facebook.com/citysquaremall. The Master’s Sun, starring So Ji Sub, will re-run on ONE starting 26 August. The drama will air every Monday to Friday at 6.25pm (SGT/MYT) on SingTel mio TV (CH 513, 604, 514, 605) and StarHub TV (CH 820, 823 and 124). What’s The Master’s Sun about? Tae Gong Sil (Gong Hyo Jin) is a secretary and tears easily. After an accident, she is able to see ghosts and this caused much distress to her life. Due to this unfortunate ability, she leads a reclusive life filled with many sleepless nights. Joo Joong Won (So Ji Sub), instead, is an ambitious and conceited CEO. He believes money is everything and only listens to what he wants to hear. After meeting Gong Sil, the self-centered Joong Won slowly starts to believe and trust her, eventually even trying to protect her. be there in manila will u ??? Just be happy and do not worry about marriage. You have the rest of your life. The question comes up so frequently that it is funny. You are a romantic and when marriage is right you will know. People do not put a lot of thought into marriage, in the USA; anymore, with cohabitation. After a couple if yrs, if cohabitation works out they might get married. We have people in their 80s cohabitating together in this country. I had an argument with my daughter at 23 yrs old because she wanted to move out and cohabitate. She did anyway and found out the guy was not for her. She is 29 and married a chemical engineer. I was brought up with a strict moral values but have come to realize that cohabitation is a good thing. You get to go through life’s little trials and errors together. When marriage is right, people get married or not. Some cohabitators have children. Men nowadays are completely domesticated. They cook, clean, change diapers, give kids baths, and put them to bed. Women married and single work full time opposit their spouse or significant other.